@noobcook : hehehe ... Thanks a lot Wiffy! @Journal Mommy Yenny : Thanks a lot Yen! Bitter melon is called 'pare' here. Who knew that worms could be so cute and edible looking! Wonderful bento style Lia! I welcome anytime such cute worms! I also saw white bitter melons and juice-stands everywhere in Taiwan while staying there. I think I should have tried white bitter melon juice, too bad!! Never heard of bittermelon juice; how interesting. Bittermelon supposed to be good for you, but it is really bitter! Even I can only eat a small bit in each mouthful. Love your sweet worms! Look perfect on their shiso leaves! Very cute worms :). How long did it take you making this bento? Those are the cutest little worms ever! I love the smiles on their faces! 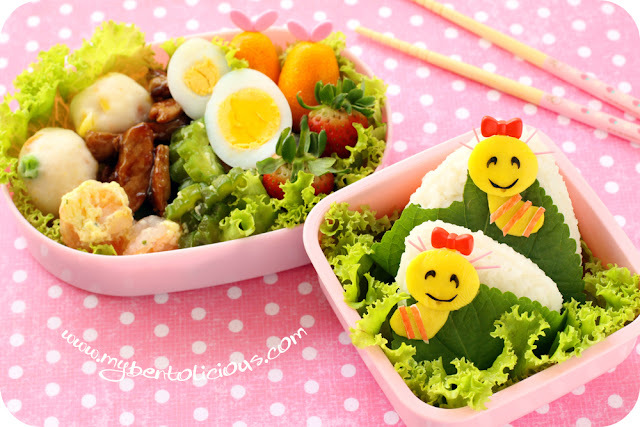 Very clever and cute bento! Fantastic egg worms, Lia! I love how they look with the shiso leaf background. I keep learning about new ingredients I want to try, like shiso leaves. Have a wonderful weekend! Beautiful... and sooo cute are those worms! @anna2003 : Don't get scare ... hehehe :) 2 hours was from the preparations, cooking, and decorating. So I think it was normal. The decorating for leaf worms only took about 20 minutes. Hi Lia, lovely bento. I love the cute worms so much. You are good in turning those 'scary' and 'ugly' things into cute & pretty things in your bento. Wonderful. Hi Lia, I'm back to see your cutie worms, look so cute and creative as always. Mbak Lia, you are a happiness maker :D. If all worms are as cute as these, I'm sure all people want to pet them instead of afraid with them hehehe. Good to know about the different degrees of bitterness based on the green shade of bitter melon, Lia--that's a great tip I will keep in mind next time I shop for them! Sweet bento, the cutest worms I've ever seen, awwww! Oh I missed these the other day...so stinking cute and delish! Lia! I've been kind-of MIA from the blogging world, but jumping in again! I miss your blog, and after looking through several old posts I think these worms are the cutest. so so cute. I bet your little girl loved them. Thank you and goodnight!